From the very first moment he brightened the lives of his family. Is there anything more perfect than looking at the world through the eyes of a child? He quickly grew into a bright, caring, happy little boy. He loved to play, was quick to learn and eager to help. He enjoyed colouring, dancing or simply chasing bubbles and kicking balls. 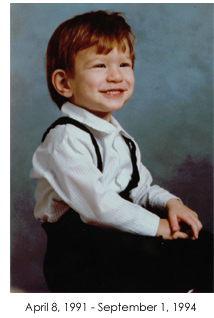 Jeremy especially loved to play with cars and trains, and was always ready to go on bike rides and swimming. It was never a problem getting him into the water, just very hard to get him out. He loved to help and be involved in everything. He enjoyed baking cookies, washing dishes, or helping to vacuum. Outside he would water the flowers, wash the car (to where he could reach) and help his Grandpa with pushing the lawnmower. Jeremy, a very affectionate child, was delighted to see the happy smiles that a simple gift of handpicked flowers (even weeds) could create. The dandelions in our logo represent this pure and innocent love of people. The butterfly represents the human spirit soaring free of pain and full of hope. (Jeremy’s Grandpa lovingly created this logo). A child’s life holds unlimited potential. We will never know what a difference Jeremy would have made to this world with his good nature and eagerness to help others. We do know that his passing left a huge hole in the hearts of all who knew him. Our legal system levied the maximum penalty for 2nd degree murder but there is no real justice. Nothing can bring him back.